SurfGuitar101.com | News: Stories with tag: "ventures"
CHARLOTTE, NC – Wilson Ventures LLC has entered into a producer partnership with Charlotte-based Studio South Holdings to produce a documentary about The Ventures, the best-selling instrumental band of all time. To fund the first-ever film, an IndieGoGo account - www.igg.me/at/theventuresmovie - launched this week. It was the band’s unique sound, largely from experimentation with guitar effects, that not only earned them the moniker “The Band that Launched a Thousand Bands,” but influenced such music greats as Peter Frampton, Elton John, George Harrison, Stephen Stills, Gene Simmons, Keith Moon, Alan White, Joe Perry, Roger Glover, John Fogerty and Joe Walsh. About the documentary, co-founder Don Wilson, says, "There is so much that people still don't know about The Ventures. From the time my partner Bob Bogle and I started with two pawn shop guitars in 1958 to having the No. 2 single in the country with Walk, Don't Run in 1960, being inducted into the Rock and Roll Hall of Fame in 2008 to right now -- the story has ups and downs, disappointments, and wow! moments, that we want to share. You're going to love it." Their original tune, Surf Rider, was in Quentin Tarantino’s Pulp Fiction soundtrack. Singles that made the charts include Hawaii Five-O, The 2,000 Pound Bee, Wipe Out and Walk, Don’t Run. In 2008, the Ventures were inducted into the Rock and Roll Hall of Fame. VENTURES French Tribute Band LES VENTURAS !! Here it is !! For the first time in France !! 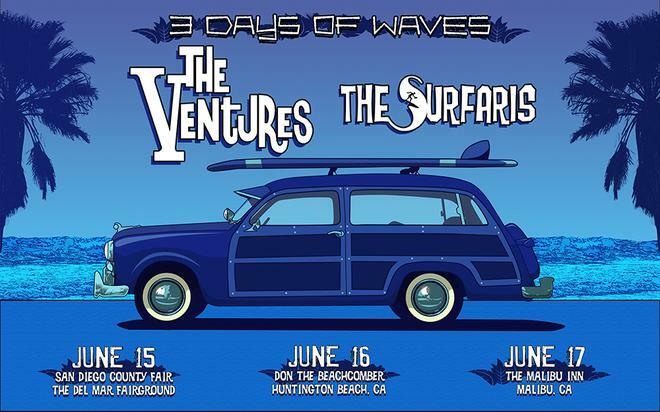 A tribute band of THE VENTURES !!! Bob Spalding, guitarist for The Ventures and now V2, has agreed to an "ask me anything" (AMA) thread right here on SG101. Please submit your questions to Bob in this forum thread. Members of The Ventures launch V2! 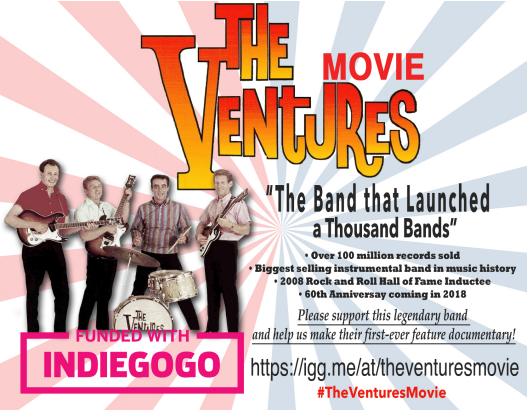 Instrumental band V2—featuring members of The Ventures, Bob Spalding and Leon Taylor—is kicking off a crowdfunding campaign on Indiegogo on February 23rd to raise funds towards producing a debut album and to introduce itself to a worldwide fan base. The album will feature a balanced mix of classic instrumentals as well as new compositions. Featured guest artists on the album will include Eric Johnson (Out Of Limits, Pipeline), Adrian Belew (Telstar), and George Tomsco (Bulldog). Tracking for the album will begin in May 2015 under the direction of Grammy-nominated producer, Chris “Frenchie” Smith. Perk offerings at various levels will include: Limited vinyl release; V2 limited edition Couch guitar strap (created only for the campaign and for featured musical guests); concert tickets; signed and numbered color print; private guitar lesson with Bob Spalding. There will also be limited perks such as picking a classic instrumental for V2 to record for the crowdfunded edition on the album (limit 3) and an Executive Producer credit (limit 4). The campaign will run for 4 weeks and will be tracked as #VivaV2. V2 is an instrumental rock band launched in 2014 by Bob Spalding and Leon Taylor, members of the iconic band, The Ventures. V2 is dedicated to preserving and advancing the “art” of the rock instrumental by performing high-energy concerts and releasing the best possible recordings. The Ventures As Played By V2 with The Del-Vipers & King Pelican! Ventures legends Bob Spalding and Leon Taylor are fronting "V2" and performing all of your favorite Ventures' tunes! 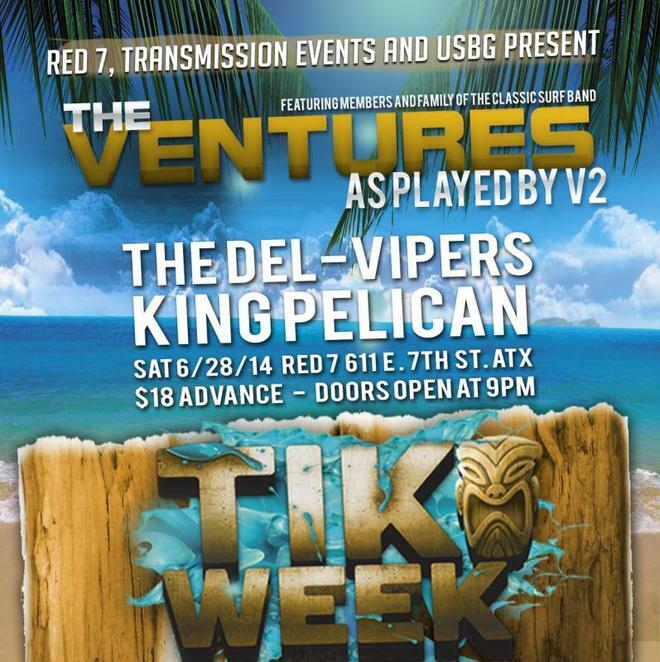 The Del-Vipers, (Austin, TX) and King Pelican (San Antonio, TX) are on the bill to things revved-up for V2! Finally after a loooong break we're back with a brand spankin' new surf music podcast. This episode features songs from albums that have been released in this year 2011. It's been a stellar year for surf music releases as this podcast will prove. There have been so many albums released that we're going to finish the list with the next podcast. Also on this episode is an interview with Don Wilson and Bob Spalding of The Ventures. This interview was conducted earlier this year by Rich Derksen aka Pappa Surf - Thanks Rich! Marty Tippens plays "Going to the Ventures Dance Party"
Rather than work on one song, last April I started to work on an entire Ventures album. It's from their Fender years and my version can be heard by clicking this link. Marty played all the instruments to the rare album "Going to the Ventures Dance Party". Follow the link to listen to the songs and be sure to read the fascinating album notes. Great job Marty!